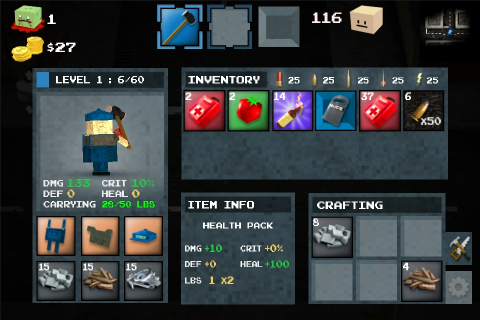 Good stuff, especially the inventory system. Definitely an upgrade. What happens if we are bleeding and we drop a whole stack of med kits will one of them be used or will the character take all of them for the same result, same thing goes for food but in the case of food let’s say we have ten apples stacked and hungry and say it’ll need five apples to get a full saturation level if we drop a whole stack wouldn’t it be better if the character takes five apples and give back the rest ? Any way tyson thanks for the update and if i had any typos because i’m writing from my iphone. When a stack of item are dragged into the character slot (for example, food, meds, like you mention), only 1 of them will be used to avoid accidentally wasting a whole stack. The rest will be dropped back into the slot you got them from. 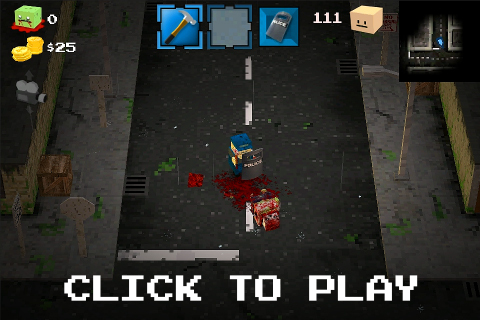 Zombies bounce off certain shields, but you cannot attack with them. Tyson you should remove or edit the icon background of the munition. It isnt look good. The background texture looks old. Oh my god, the amount of little details in this game is amazing, love the shield switching idea, can’t wait, seriously cannot wait for this. oh and one more question when we open the inventory will tge game pause.? that is my question to and is that ucc is played on computer or ios????? I have a question. Can you can cook something? Or combine Food with others? It would be nice if can implementate this. In a future update I’ll be announcing a large number of craftable work stations that will aid in the gathering, preparing and creating of resources, food, weapons, etc. Also will you ever increase the maximum inventory space.? Thats if you decide to add it. Upgradable shield..Nice one :3 tottaly agreed.Could shields make clink sounds when attacked? makes sense.. And bigger zombies like.. the football zombies that charges knock you down..when the shield is equipped..it stuns you and the zombie..
Tyson do you need a german translator? German is my mother language and i can translate your game. At this point I don’t think I’ll be localizing the game to any other languages, but thanks for the offer! No, not yet…just the iPhone 4 so far. ok but why not other languages? Hey Tyson. I’m really interested in the police shield. Where would you find it? Would a swat zombie drop it or would it be found in a police station? craftable? i hope? and be crafted with like.. barb wires? i guess…. oh and do swat zombies use it? And from the looks of the gif animation, can you only use one handed weapon when equiping the shield? like knife,hammer,hand guns etc.. When you use a 2-handed weapon, your shield is auto-switched to being carried on your back. would there be a % chance a zombie can rip the shield away from you based on what type of zombie it is? Hey again Tyson. I have a couple questions about the city itself. First, how big is it? Is it huge or will it be easy to explore all of it? Second, I know in your first videos you showed vehicles. I haven’t seen them in a while are they still implemented in the game? And last, will you be able to make a building safe enough and zombie resistant enough to have it has a sort of safe base where you are almost completely safe? The city is big, but not pointlessly big. Right now it is about one square kilometer. There will be hundreds and hundreds of buildings to explore, different areas to visit, etc…but it won’t be big enough that you’ll get pointlessly lost in it. Also I plan to augment the map a bit so you can add waypoint markers and things. Vehicles are still in the game, yes. And yup…you’ll be able to barricade yourself into a building pretty well. Eventually I’ll allow players to create permanent trap systems and things, to prevent zombies from getting in so easily. Also, zombies cannot get down into the sewers, which is a place you’ll also be able to build. Some sewers are full of zombies to begin with, but once you kill them off those sewers will be safe areas again. That being said, I’m considering adding some ‘infinite-dungeon’ sewers, that will always be full of tons of zombies, that will be good grinding areas. We’ll see.